Bessie Merrell was born February 1891, in California according to the 1900 census. [i] She was the daughter of Charles H. Merrell and his wife Nellie. Bessie also had a sister Bertha who was born in Feb 1889, in California. Charles H. Merrell died 18 Sep 1913, in Shasta County, California. His will is scanned and available at Ancestry. Nellie I. Merrill died 11 Jun 1927, in Shasta County, California. This according to the California death index. Bessie Merrell was first married to Aubrey Vestal on 7 Jun 1911, in Muck Valley, Lassen County, California. They divorced before 1916. 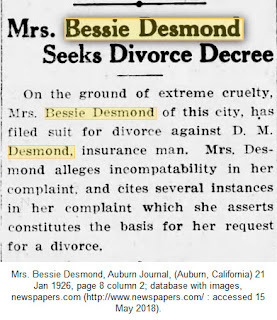 Bessie Merrell then married Dennis Montgomery Desmond on 8 Jun 1916, in Shasta County, California. There is a photo on the U.S. Passport Applications for this couple. It was difficult to find Bessie in the 1930 census. 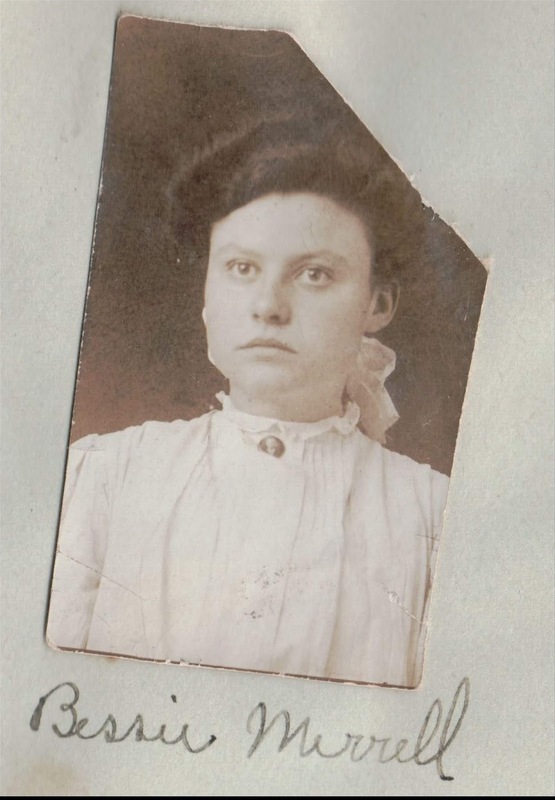 Even though she was born in 1891, she told the census taker she was 29, inferring she was born in 1901. [iv] All other information remained the same as in previous censuses. 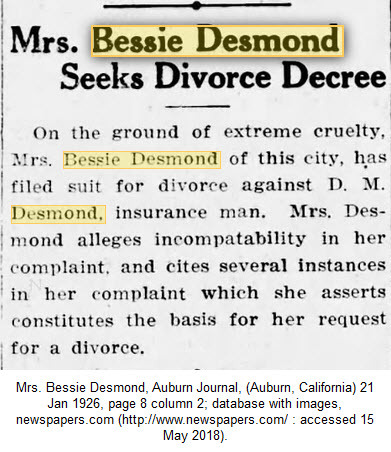 In 1932 Besse M. Desmond was living at 1502 Jackson St., Alameda, California. She was a Beauty Operator. In 1936 Mrs. Besse M. Desmond was living at 1375 California, San Francisco, California and she was an Operator. And then nothing. Nothing further was found for Bessie. No marriages, not recorded as dying, just no longer found in the records. She is possibly the person recorded in the California Death index as Desmond, died in San Francisco, California on 11 May 1938, certificate number 32299.
and Records Administration (NARA) microfilm #T623, roll # not noted by Ancestry. Records Administration (NARA) microfilm #T625, roll #87. [iii] Mrs. Bessie Desmond, Auburn Journal, (Auburn, California) 21 Jan 1926, page 8 column 2; database with images, newspapers.com (http://www.newspapers.com/ : accessed 15 May 2018). Archives and Records Administration (NARA) microfilm #T626, roll #not provided by Ancestry.